This gal was assembled from orphan parts laying around the shop including a pre-war Nobility neck, cedar top from an old classical guitar, and mahogany sides and back from my shop stash. The super short scale at 23 3/16” makes fretting really easy. This guitar will speak to players with small hands, tender fingertips or those with a soft spot for the “orphans” of the world. SPECS: Size 1 body, 14-fret (more like 13 1/2 fret) neck with solid headstock, maple neck with steel reinforcement, X-braced solid cedar top in natural finish, mahogany sides and back in stained finish, neck in black finish, bound top and back, Stewmac tuning machines, “C” neck profile, rosewood fretboard with new frets, MOP markers, rosewood bridge, bone nut and saddle. Ebony pins. Nut width: 1 9/16”, String Spacing: 2 5/16“, Scale length: 23 3/16”, Upper bout: 9 3/8“, Lower Bout: 13”, Body length: 18 3/4”, Widest body depth: 4”, Overall length: 38 1/2”, Neck thickness at 1st fret: 7/8”, Neck thickness at 5th fret: 7/8”, Action: 1/8”, string gauge setup: D’addario EJ26 custom light gauge in standard tuning. CONDITION: Solid condition with no issues. One top hairline repaired. Prior classical pin holes hidden under belly bridge. Body has scuffs, crazing, squiggles, edge wear. Other work included neckset, new fretboard/frets, bridge and setup. 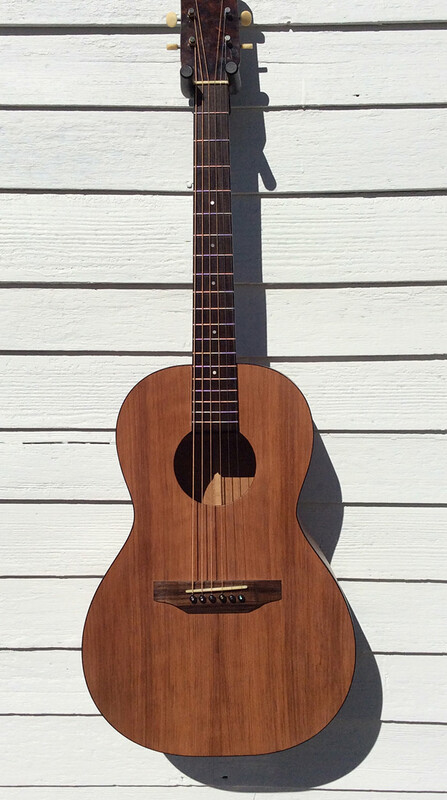 SOUND: Cedar over mahogany wood combination delivers a warm, intimate tone. Not really a strummer. Low action makes bare fingerstyle playing easy, even with a soft touch. Not likely to be your gigging guitar but definitely one you can cuddle up with on the sofa.